Dizziness is classified into three categories as a disorder; these are syncope, vertigo and nonsyncope nonvertigo, although it can be hard for a child to distinguish between the differencesamong them. Generally, syncope relates to a feeling of confusion, lightheadedness, dimmed vision or loss of consciousness. It is a sensation felt by many when they stand up too fast. Vertigo relates to the feeling of spinning, as though your heador the room is in a constant circular motion. Nonsyncope nonvertigo includes a wide range of feelings, with feeling hard to keep balance as a typical one. What Causes Dizziness in Children? Dizziness in young children is commonly caused by spinning for too long whilst playing, or standing up too fast. In these instances, there is certainly no cause for concern. That being said, there are times when the cause of the dizziness can be a more serious health condition, so be sure to speak with your pediatrician if you have noticed abnormal dizziness in your children. Benign paroxysmal positional vertigo, also known as BPPV, is caused by a rapid change in position of your head, which causes a brief, yet intense period of vertigo. This can happen when you sit up or roll over in bed. Some diseases with ears can also cause the dizzy feeling. Inner ear inflammation: If the inner ear becomes inflamed, it can cause numerous symptoms, including dizziness. It is possible for this to persist for several days. This condition usually dissipates on its own, but medical treatment can help speed up the recovery. Ear infection: It is possible for an ear infection to cause dizziness in children. This feeling should pass as the infection clears. This is a disease that affects the ear, and involves the vast build-up of fluid within your inner ear. With Meniere’s disease, a sudden episode of vertigo will happen. It is possible for this spell of dizziness to last for several hours. Those who experience migraines may also experience spells of dizziness, even if they have no headache, the most common symptom associated with a migraine, it is still possible to experience episodes of dizziness. Some medication that you give to your child may have some side effects, including loss of balance and dizziness, so be sure to check the label and instruction at first. In most cases, the episodes of dizziness should disappear when your child stops taking the medication that was believed to be causing it. There are certain anxiety disorders that can cause dizziness in children. Anxiety disorders, such as panic attacks, can lead to prolonged spells of dizziness. It is even possible for dizziness to be caused by some other problems, and to be worsened by anxiety disorders, lasting longer than normal. Anemia is the name given to the condition that leads a deficiency in essential nutrients in a person's blood, including iron, red blood cells, haemoglobin, oxygen and vitamins. There are various forms of anemia, each with different symptoms. This condition can lead to dizziness, among other symptoms like weakness and fatigue. Low blood sugar, also called Hypoglycemia, can cause dizziness. Failure to maintain the correct blood sugar levels can lead to episodes of dizziness, especially for those with diabetes. Low blood sugar levels can also lead to numerous health complications, and immediate medical attention is required if this is the case. If your child becomes dehydrated or overheated, then they may experience spells of dizziness. These episodes are little to worry about, and can easily be avoided by ensuring that they drink plenty of fluids, and don’t stay in the sun for too long. This is the term given to nonspecific dizziness which does not have an obvious cause that can be determined. This is usually associated to over sensitivity to ones own motion, which is exacerbated by complex visual imagery, such as a movie. When Should You Worry About the Dizziness in Children? 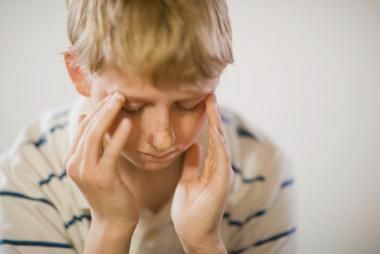 If the dizziness in your children is frequent and unexplainable, then be sure to visit their pediatrician immediately. This is especially true if the dizziness is accompanied with other symptoms, such as weakness, fatigue, nausea, blurred vision, hearing loss, fever, stiff joints, chest pain and/or difficulty walking. Usually, the episode of dizziness will pass as the cause is transient. If the dizziness is continuing to reoccur, then ensure to visit your child’s pediatrician. They will be able to assess your child, determine what may be causing it and the best cause of action to take to ease the condition. Treatments for dizziness include some medications, physical therapy and surgery in extremely rare cases. What Causes Dizzy, Vomiting but No Fever? What Causes Red Blotches on Baby Face after Eating? How Much Should a 4 Month Old Eat?